Officier medal of the French "Légion d'honneur"
The Légion d'honneur or Ordre national de la Légion d'honneur (National Order of the Legion of Honour) is a French order established by Napoléon Bonaparte, First Consul of the First Republic, on May 19, 1802. This world-renowned Order is the highest decoration in France and is divided into five various degrees: Chevalier (Knight), Officier (Officer), Commandeur (Commander), Grand Officier (Grand Officer), and Grand-Croix (Grand Cross). The royal orders of the Kings were all abolished after the French Revolution, but Napoleon saw a need to officially honor outstanding service and merit based on the principle of equality between military and civilian citizens. By honoring the different kinds of services rendered to the country, this new order reflected the ideals of the revolution. The original statutes have been slightly amended over the years, but in 1962 General Charles de Gaulle restored the Legion of Honor to its original concept as the highest general military and civil order of merit. Today the award can be given to men and women, French citizens and foreigners, civilians and military personnel. The order's motto is Honneur et Patrie (Honour and Fatherland), and its seat is the Palais de la Légion d'Honneur on the left bank of the Seine river in Paris. Napoleon, as emperor, always wore the cross and Grand Eagle of the Légion d'Honneur. Prior to the Revolution The Order of St. Louis was the most popular in the French kingdom. Louis XIV founded it in 1693. It was comprised of grand crosses, commanders and chevaliers or knights, all of whom were Catholic officers of the royal army. Louis XV instituted the Order of Military Merit for Protestant foreign officers serving in France. After the Revolution it was Napoléon Bonaparte, the First Consul and de facto sole ruler, who created a reward to commend civilians and soldiers that became the Légion d'Honneur, a body of men that was not an order of chivalry like the old nobility system, but an order of Merit. From its beginning it was conferred on illustrious individuals in all walks of life—the military, magistrates, administrators and civil servants as well as men of distinguished achievement in the arts, fine arts, teaching, agriculture, trade, and industry. Napoléon Bonaparte, First Consul of the French Republic, awards some of the first Légions d'honneur' on August 16, 1804, at the camp of Boulogne. On July 15, 1804, the first Légion d'Honneur were awarded in the Chapel of The Invalides with the emperor personally bestowing the awards in a grand military and religious ceremony. Along the first to be honored were eighteen marshals, five cardinals and a number of scholars, scientists, writers and composers. By 1812, 1,400 civilians had been decorated. A few weeks later on, August 16, in a solemn military ceremony held at Boulogne-sur-Mer, the troops who were to embark for England and were within sight of the enemy’s shores were personally bestowed the new honor by Napoleon. To spur the members of the Legion to even greater efforts in the service of their country he instituted four ranks in the Legion: knight, officer, (commander until 1814), and grand-officer. In addition, Napoleon, as Emperor, added a fifth rank: Grand croix (cross), called "grand-eagle" during his reign. The ranks of grand officer and grand cross are known as dignités. After the reestablishment of the nobility in 1808, award of the Légion gave way to the title of "Knight of the Empire" (chevalier de l'empire). The title was made hereditary after three generations of grantees. 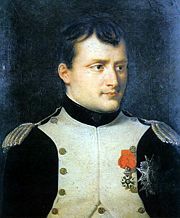 Napoleon had dispensed 15 golden collars of the legion among his kinsmen and the highest of his ministers. This collar was abolished in 1815. The Légion d'honneur was prominent and visible in the empire. The Emperor always wore it and the fashion of the time allowed for decorations to be worn most of the time. Napoleon's personal decorations were captured by the Prussians and were displayed in the Zeughaus (armory) in Berlin until 1945. Today, they are in Moscow. Louis XVIII changed the appearance of the order, but it was not abolished because it would have angered the 35-38,000 who were already members. The images of Napoleon and his eagle were removed and replaced by the image of Henry IV, the popular first king of the Bourbon line. Three Bourbon Lilies (fleur-de-lys) replaced the eagle on the reverse of the order. A king's crown replaced the imperial crown. In 1816, the grand cordons were renamed grand crosses and the legionnaires became knights. The king decreed that the commandants were now commanders. Although, during the Hundred Days, Napoleon had revoked the Légion d'honneurs bestowed by Louis XVIII, the Order itself was maintained; but there was an attempt to diminish its prestige by giving it second place after the Order of Saint Michael and the Royal and Military Order of Saint Louis. Insignias with figure of Henry IV. Certificate honoring the recipient of a Légion d'honneur. 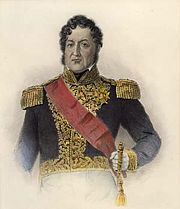 Louis Philippe, King of the French, wearing the sash of the order. France's first constitutional monarch, King Louis-Philippe of the House of Orleans, abolished the other orders of the monarchy and restored the order of the Légion d'honneur in 1830 as the sole decoration of the French nation. The insignia were drastically altered. The cross now displayed tricolor flags. Yet another revolt in Paris (1848) brought a new republic and a new design to the Légion d'honneur. A nephew of the founder, Prince Napoléon was elected president and he restored the image of his uncle on the crosses of the order. In 1852 the first officially recorded woman, Angélique Duchemin a revolutionary in the 1789 uprising against the absolute monarchy, was admitted into the order. President Napoleon staged a coup d'état and made himself emperor of the French in 1852. An Imperial crown was added. During Napoleon III's reign the first American was admitted—Dr. Thomas Wiltberger Evans, dentist of Napoleon III. In 1870 the defeat of the army in the Franco-Prussian war brought another Republic. As France changed, the Légion d'honneur changed as well. The crown was replaced by a laurel and oak wreath. In 1871, during the Paris Commune, the Hôtel de Salm, headquarters of the Légion, was burned to the ground in street fighting and the archives of the order were lost. During the First World War, some 55,000 decorations were conferred, 20,000 to foreigners. The large number of decorations was due to the new posthumous awards authorized in 1918. Traditionally membership in the Légion could not be awarded posthumously. The oath which the Legionnaires had previously sworn to the various regimes were abolished during the Third Republic. 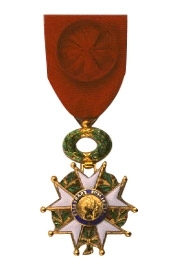 In 1940 General Charles De Gaulle, Leader of the Free French movement, out of respect for French institutions—which he considered as having fallen into abeyance—refused to award the medal of the Légion d'honneur and decided it was necessary to create a special and original decoration. On November 16th, 1940, in Brazzaville—capital of the nascent Free France, he signed Edict No. 7, which created the Order of the Liberation. When he stepped down in January of 1946, General De Gaulle signed a decree that suspended the nominations to be awarded the Cross of the Liberation (decree of January 23, 1946). Since the goal of liberation had been achieved, the Order was deactivated. It was only reactivated in 1958 for Winston Churchill and in 1960 for King George VI, posthumously. Later when De Gaulle became president of France he formally established a new decoration known as the National Order of Merit. This reestablished the Légion d'honneur as the premiere award for "eminent service." "Distinguished service" is now rewarded with the new Order of Merit, whose lapel ribbons and rosettes look like the Legion's, except that the color is blue. The National Order of Merit was established one year after the code of the Légion d'honneur was revised. This new code harmonized the system of French decorations and replaced a number of ministerial orders. Only four of these are still awarded: The Ordre des Palmes Académiques, the Ordre du Mérite Agricole, the Ordre du Mérite Maritime and the Ordre des Arts et des Lettres. Controversy over whether the award is losing its original value has been ongoing throughout modern history. In 2008, Paris-based broadcaster Johnny Summerton questioned the value of the Légion d'honneur when it was granted to the judge who gave the French president, Nicolas Sarkozy, his divorce in 2007 and to the man who introduced him to his new wife a short time later. "But it's the apparent trend to broaden the scope that has many questioning whether it any longer has a true value," he wrote. The organization of the Légion d'honneur has remained the same since 1852. The Chief of State, the President of the Republic, is accorded the rank of Grand Cross upon taking office and automatically becomes the Grand Master of the Order. After his term expires, he remains a Grand Cross. The Grand Master chooses and appoints the Grand Chancellor from among the Grand Crosses or the Grand officers. This is one of the highest positions in the French Republic and the appointment is for a six-year renewable term. The Grand Chancellor is chairman of the Council of the Order and directs the administrative services housed in the Palace of the Légion d'honneur in Paris. He represents the Légion d'honneur in litigation, is the keeper of the Seal of the Order and presents to the Chief of State all the reports, draft decrees, regulations and decisions concerning the Légion d'honneur. Each new President of the Republic receives the Collar of the Grand Master of the Order from the Grand Chancellor. Members of the Légion d'honneur are appointed for life. In peacetime, twenty years of distinguished military or civilian service are required for admission to the Order. Candidates are nominated by the various Ministers, who submit their names to the Grand Chancellor. He in turn presents them to the President of the Republic. French nationals, men and women, can be received into the Légion, for "eminent merit" (mérites éminents) in military or civil life. In practice, in current usage, the order is conferred, in addition to military recipients, to many entrepreneurs, high-level civil servants, sport champions and people with high connections in the executive branch of the government. The members of the French Parliament cannot receive the order, except for valor in war, and ministers are not allowed to nominate their accountants. A Legionnaire can be received into the Order only by another Legionnaire of at least equal rank. These requirements do not apply to foreigners receiving the award. French nationals are always initially received in the Légion to the class of chevalier (knight). To be promoted to a higher class, one must prove new services to France and a set number of years must pass between appointment and promotion. The only exception is the President of the Republic, who is made a grand cross de jure upon his accession to the presidency. Foreigners are not admitted in the Légion as such, but may be decorated with the insignia of the Légion. A foreigner can be decorated directly with the insignia of a higher class. Foreign heads of state and the wives or consorts of monarchs are made Grand Cross as a courtesy. Wearing the decoration of the Légion d'honneur without having the right to do so is an offense. Wearing the ribbon or rosette of a foreign order of knighthood is prohibited if that ribbon is mainly red, like the ribbon of the Légion. Members convicted of a severe crime (plain crime in French) are dismissed de jure from the order. Members convicted of a lesser felony (délit in French) can be dismissed too. Collective appointments can also be made to cities, institutions, companies, or military units. In the case of a military unit, its flag is decorated with the insignia of a knight, which is a different award than the fourragère. Cities proudly display the decoration in their coat of arms. No emblem had ever received the Légion d'honneur until Napoleon III bestowed it upon the flags of regiments that had distinguished themselves during the Italian campaigns. Only one flag was so honored in 1870, the standard of the 57th Régiment de Ligne. From 1859 to 1947, fifty-seven flags were decorated, including those of the Paris and Reims fire brigades, the "Ecole Polytechnique," the "Ecole Navale" and the "Ecole de l’Air." In 1954, President René Coty awarded the Légion d'honneur to the flags of the Le Havre and Rouen fire brigades. The award was first given to French cities during the Hundred Days. After 1870 the Republic rewarded several cities, including Paris (1900). Thirty-one were decorated between 1914 and 1917, sixteen of them during World War I. Cities honored include Liège in 1914, Belgrade in 1920, Luxembourg in 1957 and Stalingrad (today's Volgograd) in 1984 were decorated, as were 51 regiments and the Military School of Autun. Twenty-one schools, mainly higher education institutions providing the bulk of reserve officers during the World Wars, were awarded the Légion d'honneur. They share this distinction with the Red Cross, the abbey of Our Lady of Dombes and the state-railway company SNCF. When the French Revolution closed the doors of the convent schools it brought the end of educational institutions for girls. Only a few exclusive schools were available to girls at the beginning of the First Empire. Napoleon was aware of this lack and on December 15, 1805, in Schönbrunn, signed the decree which established "lay schools for daughters of the members of the Legion of Honour." They were located in the Ecouen Château in 1807 and in the ancient abbey of Saint Denis in 1809. Today the boarding schools are state establishments under the authority of the Grand Chancellor. The girls enrolled have a direct ascendant who is a holder of either the Légion d'honneur, the Order of Merit or of the Military Medal. A thousand children and grandchildren of the members of the order are educated in these schools annually. Foreigners may be nominated for membership in the Légion d'honneur by the Minister of Foreign Affairs. They can be admitted at any rank and promoted regardless of how long they have been members. In the United States, Generals of the Army Dwight Eisenhower and Douglas MacArthur are among the 10,000 Americans who have received the decoration. In 1949, the Academies of West Point and Annapolis were also decorated. Although it is rare for an ambassador in Paris to be awarded the Légion d'honneur, a posthumous exception was made for the United States ambassador Pamela Harriman in 1997. The last surviving American World War I veteran, Frank Buckles, also received this honor. In 2004, on the 60th anniversary of D-Day, French president Jacques Chirac saluted the United States for its part in ending World War II by awarding one hundred American veterans with the Legion d'honneur. In 1998, France observed the 80th anniversary of the World War I armistice by awarding Légion d'honneur medals to American veterans of that conflict as well. Additionally, in the United Kingdom Queen Elizabeth II, Prince Philip and the late Lord Mountbatten have been decorated with the Grand Cross. King Carl XVI Gustaf of Sweden has also been decorated with the Grand Cross. Australian General Sir John Monash was decorated with the Grand Officer during the First World War and Air Chief Marshal Angus Houston, Chief of the Australian Defence Force, received the degree of Commander in 2007. Other high level foreigners to be awarded include Vladimir Putin, President of Russia at the time, who received the award in September 2006 and Shimon Peres, President of Israel at the time, who received the award in March 2008. The list of recipients is quite diverse, including such names as Mahmoud Hesabi (1903-1992), Iranian scientist, Alexander Graham Bell, Paul Hewson (aka Bono), Fairuz (Arabic: فيروز also spelled Fairouz or Fayrouz) a distinguished Lebanese singer, William Joseph Donovan, KBE United States Army, was an American soldier best remembered as wartime head of the Office of Strategic Services (OSS) and the "father" of today's Central Intelligence Agency (CIA), and Rear Admiral Jules Sébastien César Dumont d'Urville, French explorer and naval officer. For a complete list of recipients go to French Legion of Honor. The five classes wearing their respective insignia (gentlemen). Grand-Croix (Grand Cross): Formerly grande décoration, grand aigle or grand cordon, wears the badge on a sash on the right shoulder, plus the star on the left chest. Grand Officier (Grand Officer): Wears the badge on a ribbon with a rosette on the left chest, plus the star on the right chest. Commandeur (Commander): Formerly commandant, wears the badge on a necklet. Officier (Officer): Wears the badge on a ribbon with a rosette on the left chest. Chevalier (Knight): Formerly légionnaire, wears the badge on a ribbon on the left chest. The sitting President of the Republic, as grand master of the order, wears the Grand Collar of the Légion, which is presented to him upon his investiture. The badge of the Légion is a five-armed "Maltese Asterisk" (for want of a better description—see Maltese Cross) in gilt (in silver for chevalier) enameled white, with an enameled laurel and oak wreath between the arms. The obverse central disc is in gilt, featuring the head of Marianne, surrounded by the legend République Française on a blue enamel ring. The reverse central disc is also in gilt, with a set of crossed tricolores, surrounded by the Légion's motto Honneur et Patrie (Honour and Fatherland) and its foundation date on a blue enamel ring. The badge is suspended by an enameled laurel and oak wreath. The star (or "plaque") is worn by the Grand Cross (in gilt on the left chest) and the Grand Officer (in silver on the right chest) respectively; it is similar to the badge, but without enamel, and with the wreath replaced by a cluster of rays in between each arm. The central disc features the head of Marianne, surrounded by the legend République Française (French Republic) and the motto Honneur et Patrie. The ribbon for the badge is plain red. The badge or star is not worn usually, except at the time of the decoration ceremony or on a dress uniform. Instead, one normally wears the ribbon or rosette on one's suit. The old de Salm mansion on the Quai d’Orsay in Paris has housed the central offices and the Museum of the Légion d'honneur since 1804. Built shortly before the French Revolution, the building was burned by the Commune in 1871 and reconstructed from a fund raised by Legionnaires. The mansion has been restored to its original 1789 state, with the exception of the wings added in 1925 for the Museum established by General Auguste Dubail, Grand Chancellor from 1918 to 1934. The Museum possesses a complete collection of the Orders of the former Regimes and their various insignia, along with paintings, engravings and important historical mementos. Late Empire Légionnaire insignia: the front features Napoleon's profile and the rear, the imperial Eagle. An imperial crown joins the cross and the ribbon. Louis XVIII era (1814) Knight insignia: the front features Henry IV's profile and the rear, the arms of the French Kingdom (three fleurs de lis). A royal crown joins the cross and the ribbon. Rear of a Republican cross, with two crossed French flags. Fifth Republic Knight insignia: The center features Marianne's head. A crown of laurels joins the cross and the ribbon. Medal for the officer class, decorated with a rosette. Chiang Kai-shek's Légion d'honneur plaque. In his time the plaque was made of silver. Chiang Kai-shek's Légion d'honneur. This is the reverse of his Grand Cross. The insignia of a Grand Cross. The star of a Grand Cross is gilt. The silver star is the Grand Officer's badge. ↑ Ordredelaliberation.fr, Introduction to the Order of the Liberation. Retrieved July 31, 2008. ↑ French, translatable as "Legion of Hono(u)r," but known as the Légion d'honneur to avoid confusion with similarly-named decorations (for example, the Philippine Legion of Honour). ↑ Jo Dunn, The Legion of Honor: A Personal Story. Retrieved July 30, 2008. ↑ Ambafrance-us.org, History of Légion d'honneur. Retrieved July 31, 2008. ↑ Pierre-Louis Roederer, "Speech Proposing the Creation of a Legion of Honour," Napoleon: Symbol for an Age, A Brief History with Documents, ed. Rafe Blaufarb (New York: Bedford/St. Martin's, 2008), 101-102. ↑ Ambafrance-au.org, The Legion of Honour. Retrieved July 31, 2008. ↑ Ordredelaliberation.fr, Admission to the Order. Retrieved July 31, 2008. ↑ Time Magazine, The Scarlet Epidemic. Retrieved July 31, 2008. ↑ Johnny Summerton, What value in France's top award—the Légion d'honneur? Retrieved July 31, 2008. ↑ All Olympic Gold Medal winners are awarded the Légion. Byrne, Daniel M. 1996. Identification of French Orders and Medals. Tulsa, OK: D.M. Byrne. OCLC 35262683. Chefdebien, Anne de, and Bertrand Galimard de Flavigny. 2002. La Légion d'honneur: un ordre au service de la nation. Découvertes Gallimard. Paris: Gallimard. ISBN 2070765253. Humbert, Jean-Marcel, and Ray Beaumont-Craggs. 1996. L'Hôtel de Salm: palais et musée de la Légion d'honneur: Salm mansion, palace and museum of the Legion of Honour. Saint-Ouen, FR: Editions la Goélette. ISBN 9782906880429. Paris, William Francklyn. 1927. Napoleon's Legion. New York and: Funk and Wagnalls Co. OCLC 602522. All links retrieved August 4, 2018. This page was last modified on 4 August 2018, at 21:35.